The Gulag Archipelago 1918-1956 (1973) by Aleksandr Solzhenitsyn is an account of the Soviet prison system, based on extensive research and Solzhenitsyn's own experiences as a prisoner in the Gulag. It is composed of 7 sections, and often divided into 3 volumes. For years, I have with a reluctant heart withheld from publication this already completed book: my obligation to those still living outweighed my obligation to the dead. But now that State Security has seized the book anyway, I have no alternative but to publish it immediately. From good to evil is one quaver, says the proverb. And correspondingly, from evil to good. The Universe has as many different centers as there are living beings in it. Each of us is the center of the Universe, and that Universe is shattered when they hiss at you, "You are under arrest." What would things have been like if every Security operative, when he went out at night to make an arrest, had been uncertain whether he would return alive and had to say good-bye to his family? Or if, during periods of mass arrests, as for example in Leningrad, when they arrested a quarter of the entire city, people had not simply sat there in their lairs, paling with terror at every bang of the downstairs door and at every step on the staircase, but had understood they had nothing left to lose and had boldly set up in the downstairs hall an ambush of half a dozen people with axes, hammers, polkers, or whatever else was at hand? Socrates taught us: "Know thyself." And correspondingly, from evil to good. We forget everything. What we remember is not what actually happened, not history, but merely that hackneyed dotted line they have chosen to drive into our memories by incessant hammering. Oaths! Those solemn pledges pronounced with a tremor in the voice and intended to defend the people against evildoers: see how easily they can be misdirected to the service of evildoers and against the people! This is surely the main problem of the twentieth century: is it permissible merely to carry out orders and commit one's conscience to someone else's keeping? Can a man do without ideas of his own about good and evil, and merely derive them from the printed instructions and verbal orders of his superiors? Oaths! Those solemn pledges pronounced with a tremor in the voice and intended to defend the people against evildoers: see how easily they can be misdirected to the service of evildoers and against the people! In 1944, investigator, proud of his faultless logic [...] told Babitsh: "Investigation and the process are merely juridical figaration, that can't change your destiny, which has been determined before. If it is necessary to shoot you, you'll be shot, even if you're completely innocent." In 1946, a special rule by plenum of Supreme Court of the USSR (July 12, 1946, nr. 8/5/u) was necessary: "On the possibility of exercising punishment only on those persons, who have committed a certain crime." But this was freely bypassed. It would appear that during the one thousand one hundred years of Russia's existence as a state there have been, ah, how many foul and terrible deeds! But among them was there ever so multimillioned foul a deed as this: to betray one's own soldiers and proclaim them traitors? Governments were never moral beings. In his instructions on the use of Red Terror, the Chekist M. I. Latsis wrote: "In the interrogation do not seek evidence and proof that the person accused acted in word or deed against Soviet power. The first questions should be: What is his class, what is his origin, what is his education and upbringing? [There is your Sapropelite Committee for you!] These are the questions which must determine the fate of the accused." Six geologists got §58-7, everyone ten years, for "deliberate hiding (!-for not discovering!) of a lead deposit for the sake of German arrival"
In the winter of 1934, the agronomists of Pskovsk oblast sowed flax on the snow — exactly as Lysenko had ordered. The seeds expanded, grew mouldy and died. The vast fields stayed empty throughout the year. Lysenko of course couldn't call the snow a kulak or himself an idiot. He accused the agronomists of being kulaks and distorting his technology. And the agronomists were sent to Siberia. However, our political courts — the special collegia of provincial courts, the military tribunals (and why, actually, should there be military tribunals in peacetime anyway? ), and all the supreme courts too — unanimously followed the path of the OSO [Special Boards attached to the GPU-NKVD]. They, too, did not get stuck in the mud of public trials or in arguments between sides. Their primary and principal distinguishing feature was closed doors. They were first of all closed courts — for their own convenience. And by now we have become so accustomed to the fact that millions and millions of people were tried in closed sessions and have become used to this for so long that now and then some mixed-up son, brother, or nephew of a prisoner will even snort at you with convinction: "And what would you have wanted? ... There's information here. Our enemies will find out! You can't do it!" Thus the fear that our "enemies will find out" makes us clamp our head between our own knees. Who in our Fatherland, except some bookworms, remembers now that Karakozov, who fired at the Tsar, was provided with a defense lawyer? Or that Zhelyabov and all the Narodnaya Volga group were tried in public, without any fear that the "Turks would find out?" Or that Vera Zasulich, who attempted to kill the official who was, translated into Soviet terms, the Chief of the Moscow Administration of the MVD — although she missed, and the bullet went past his head — not only was not destroyed in a torture chamber but was acquitted in open court by a jury — no Troika — and then went off in triumph in a carriage? In every lesson, whether speaking of the anatomy of earthworms or the conjunctions in a complex sentence, you inevitably had to give a blow to God (even if you believed in him), you had not to forget glorifying our boundless freedom (even if you hadn't slept in the night, waiting for knocking on the door), by reading Turgenev, or pointing Dnepr at the map, you inevitably had to damn the misery of the previous regime and glorify affluence of the present time (while you and the children had seen whole villages dying of starvation and the bread was 300 g for children in cities). The authors don't see anything more encouraging than camp labour. According to them, hard labour is one of the highest forms of the passionate conscious creation. The authors don't see anything more encouraging than camp labour. 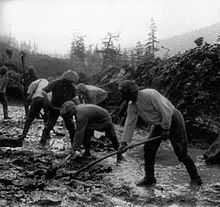 According to them, hard labour is one of the highest forms of the passionate conscious creation. […] Because this "processing of the human raw material is naturally more complicated than processing of lumber," — what a language! what depth! who has said that? — this has been said by Gorky in his book, discarding the "verbal tinsel of humanism". Ch.3, On the book by M.Gorky and other Soviet writers regarding the building of White Sea-Baltic Sea canal. There were many prisoners […] who, during the first days of the war, wrote petitions: they asked to be sent to the front. They had tasted the thickest, the most stinking camp swill — and then pleaded to be sent in the front line to defend the same camp system, to die for it in the penalty company! […] This bout was not ideological, it came from the bottom of heart — it expressed the Russian character: better to die in a wide field than to decay in a narrow shanty! The whole raison d'etre of serfdom and the Archipelago is one and the same: these are the social structures for the ruthlessly enforced utilization of the free-of-cost work of millions of slaves. Philosophers, psychologists, doctors, writers could have observed in our camps more than in anywhere else in all the versatility and in full details the specific process of narrowing of man's mental and intellectual horizon, decline of a man to the level of an animal and his process of dying alive. Their commune, more precisely: their world is a separate world inside ours and the harsh rules which have existed there for centuries, to have this world remained firm, do not depend to the slightest degree on our "prayer" legislation, nor even on party congresses. And what does their word "prayer" mean? Frayer means all human, something that every normal human being has. This very human world, our world with its moral, living habits and mutual communications is in thieves' view the most hateful, the most ridiculous, it is the biggest opponent to their antisocial thief world hostile to society. Nay, as you can expect no corn grow on a rocky ground, likewise you can't expect any goodness from a thief. With its laws, Stalin's authorities made the bandits clear: don't steal from me! steal from private persons! Private property is a survival from the reactionary past. Work fine and you shall be buried in coffin as well! And on July 7, 1941, four days after Stalin's panic speech, as German tanks were nearing Leningrad, Smolensk and Kiev, another decree by the Presidium of the Supreme Soviet was issued. [...] The problem was that the Prosecutor of the USSR (Vyshinksky?) had complained the Supreme Soviet [...] that the courts were misusing the decree of 1935: children are judged only in case they have committed the crime deliberately. But this is really unjustified mildness! And the Presidium clarifies in the course of war flames: such an interpretation is not in accordance with the text of the law, it adds restrictions not determined by the law!... And in concord with the prosecutor, the Supreme Court is being clarified: the children must be judged by using all the penal rates (i.e with full severity) even if the crime is not committed deliberately but out of carelessness. That's something indeed! Maybe no one else during the world history has reached so close to the final solution of the children's question. From the twelfth year on, out of carelessness — and up to the sentence to death! The paragraph 58 had no minimum of age! So was it even told at the lectures on law held for the people — Tallinn, 1945. Dr Uusmaa had known a six year old boy, who was in the colony on the ground of paragraph 58 — this is obviously a record! In March, 1972 Britain was shocked when a 14 year old English boy was sentenced to 6 years of prison in Turkey for having done business with large quantities of drugs […]. But where were the eyes and hearts of your left wing leaders and lawyers, when you read about Stalin's laws on juveniles? In the district centre of Chingirlau, Kustanai oblast, a hungry 14 year old girl picked up a narrow line of grain fallen into the dust from a truck. She was penalized only 3 years with the extenuating circumstances of not having plundered the socialist property directly from field or cornloft. When after the war a foreman of Inta lumber plant was buried in coffin, the culture and re-education department received instructions to agitate: Work fine and you shall be buried in coffin as well! A duel with years and with walls constitutes moral work and a path upward (if you can climb it). Chapter 1. Looking back, I saw that for my whole conscious life I had not understood either myself or my strivings. What had seemed for so long beneficial now turned out in actuality to be fatal, and I had been striving to go in the opposite direction to that which was truly necessary to me. But just as the waves of the sea knock the inexperienced swimmer off his feet and keep tossing him back on to the shore, so also was I painfully tossed back on dry land by the blows of misfortune. And it was only because of this that I was able to travel the path which I had always really wanted to travel. It was granted me to carry away from my prison years on my bent back, which nearly broke beneath its load, this essential experience: how a human being becomes evil and how good. In the intoxication of youthful successes I had felt myself to be infallible, and I was therefore cruel. In the surfeit of power I was a murderer and an oppressor. In my most evil moments I was convinced that I was doing good, and I was well supplied with systematic arguments. And it was only when I lay there rotting on prison straw that I sensed within myself the first stirrings of good. Gradually it was disclosed to me that the line separating good and evil passes not through states, nor between classes, nor between political parties either - but right through every human heart - and through all human hearts. This line shifts. Inside us it oscillates with the years. And even within the hearts overwhelmed with evil, one small bridgehead of good is retained. And even in the best of all hearts, there remains…an un-uprooted small corner of evil. Since then I have come to understand the truth of all the religions on the world. They struggle with the evil inside a human being (inside every human being). It is impossible to expel evil from the world in its entirety, but it is possible to constrict it within each person. And since that time I have come to understand the falsehood of all the revolutions of history: they destroy only those carriers of evil contemporary with them (and also fail, out of haste, to discriminate the carriers of good as well). And they take to themselves as their heritage the actual evil itself, magnified still more. Remember everything you did that was bad and shameful and take thought —can you possible correct it now? Yes, you have been imprisoned for nothing. "Know thyself!" There is nothing that so aids and assists the awakening of omniscience within us as insistent thoughts about one’s own transgressions, errors, mistakes. After the difficult cycles of such ponderings over many years, whenever I mentioned the heartlessness of our highest-ranking bureaucrats, the cruelty of our executioners, I remember myself in my captain’s shoulders boards and the forward march of my battery through East Prussia, enshrouded in fire, and I say: "So were we any better?" In prison, both in solitary confinement and outside solitary too, a human being confronts his grief face to face. This grief is a mountain, but he has to find space inside himself for it, to familiarize himself with it, to digest it, and it him. This is the highest form of moral effort, which has always ennobled every human being. A duel with years and with walls constitutes moral work and a path upward (if you can climb it). And all those changes in the newspaper headlines with regards to Nazis — once the meetings of our friendly sentries in this shabby Poland, and waves of sympathy for those brave soldiers, who fight against the Anglo-French bankers, and Hitler's uncut speeches over whole pages of Pravda; and then suddenly one morning the explosion of headlines, claiming the whole Europe is moaning heart-breakingly under their heel. And if those who came had not been so hopelessly asinine and arrogant, had not kept the Kolkhoz administration comfortable for the Greater Germany, had not invented such a disgust as turning Russia into a colony, then the national idea would not have concentrated there where it was being strangled all the time, and hardly would it have been possible to celebrate the 25th anniversary of Russian Communism. Having justifiably learnt to distrust Soviet propaganda in everything, we naturally couldn't believe those fairy tales, as if the Nazis wanted to make Russia their colony and us the German slaves, it was impossible to presume such an idiocy in XXth century heads, one couldn't believe it, unless one had experienced it itself, with one's own flesh. The coming church trials were internal. They didn't interest progressive Europe. And they could be conducted without a code. We have already had an opportunity to observe that the separation of church and state was so construed by the state that the churches themselves and everything that hung in them, was installed in them and painted in them, belonged to the state, and the only church remaining was that church which, in accordance with the Scriptures, lay within the heart. And in 1918, when political victory seemed to have been attained faster and more easily than had been expected, they had pressed right on to confiscate church property. However, this leap had aroused too fierce a wave of popular indignation. In the heat of the Civil War, it was not very intelligent to create, in addition, an internal front against the believers. And it proved necessary to postpone for the time being the dialogue between the Communists and the Christians. For twenty years, the religion was being persecuted and the churches closed. The Germans came and began re-opening churches […] In Rostov-on-Don the inauguration became a huge jubilation, that attracted lots of people. But of course they should have damned the Germans for that, eh? The first fruits of the popular victory in Stalingrad were the decree on the militarisation of railroads (boys and women to tribunal) and one day later (April 17) the decree on introduction of hard labour and gallows. In May 1943, during the German occupation, in a garden at Podlesnaya street in Vinnica, incidentally was started the excavation of graves already unnoticeable and overgrown with grass — and 39 mass graves were found […]. In June, excavation started near orthodox cemetery, and another 42 graves were found. […] Altogether, 95 graves with 9439 bodies. And that only in Vinnica, where these were incidentally discovered. But how many might have been hidden in other towns? And the population should have rushed to become Soviet partisans, having seen those graves? There in Rostov, Aleksandr Petrovich M.-V., an engineer was arrested in one the first days of war, he died in the preliminary inquiry chamber, his wife shuddered for months, waiting when she would be arrested, — and only after the German arrival could she go to sleep calmly: Now I can have a rest at last! Nay, she should have prayed for her butchers to return. Who remembers the great flight of people from Northern Caucasus in January 1943 — and who can show a counterpart from the world history? The population, especially rural, massively going with the defeated enemy, the foreigners — in order not to remain under the victorious own — carts, carts, carts in the severe windy January frost! And all that was written about the foreign countries, — in 1930s about the inevitable collapse of the West, the treacherousness of the Socialists, the unanimousity of all Spain against Franco (in 1942 the treacherous freedom fight of Nehru — it weakened the British empire, Soviet wartime ally) — proved to be lies. Oh, Western freedom-loving "left-wing" thinkers! Oh, left-wing labourists! Oh, American, German and French progressive students! All of this is still not enough for you. The whole book has been useless for you. You will understand everything immediately, when you yourself — "hands behind the back" — toddle into our Archipelago. The Gulag Archipelago in the original Russian, parts 1 and 2, parts 3 and 4, and parts 5, 6, and 7.